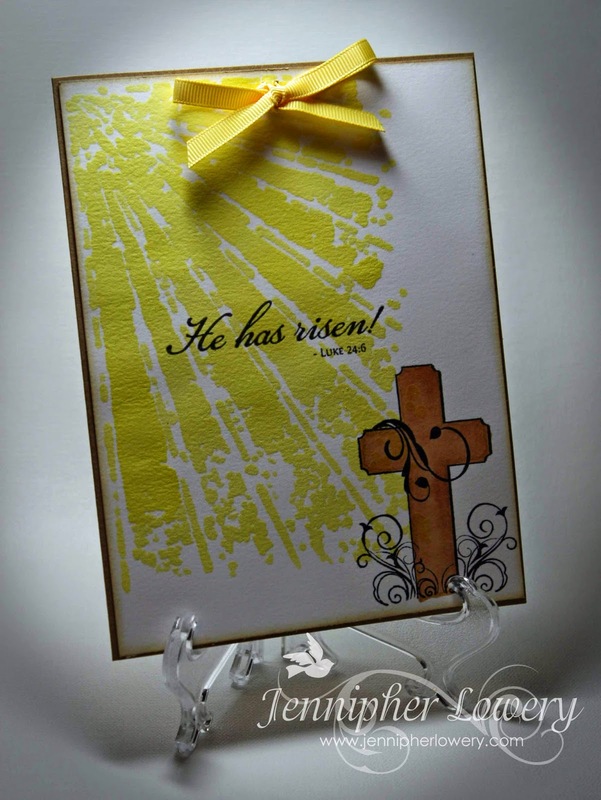 Paper Expressions by Jennipher: He Has Risen! Hello everyone. It's been a couple of weeks since I had a chance to create anything and post it. I hate it when life gets in the way of my creativity but, sometimes it just can't be helped. The card I am sharing with you today was inspired by this month's Verve Inspiration Challenge Babies & Bunnies. The challenge was to create a card for Easter or a bouncing new Baby. I chose to go with the Easter theme. Using Verve's Everlasting Life stamp set. I wanted it to appear as if she sun was shining down on the cross. I created that effect by using the Texture Shine stencil by Memory Box and Squeezed Lemonade distress stain. This card is a lot more clean and simple than my usual style but, I did not want to cover up the pretty stenciling. This is beautiful! Love how you did the sun ray with this cross. Your stenciled sun rays look amazing shining down on this cross! What an awesome CAS Easter design that shares the true joy of Easter, Jennipher! He is risen, indeed! Thanks be to God! The stenciled sun rays is the star of this card! wow!! I love the sunshine rays! Great job. Oh Jennipher, this is a vision! What a gorgeous card with the glorious sun rays and bright sun burst! I just love the rays of sun shining down on the cross- what a Stunning card design- love the simplicity of it- but the message is huge!! !